You can engrave this in your brain–A gunfight is going to be what it’s going to be. It will probably come as a complete surprise. The attack will most likely come much faster than a person expects. And it will undoubtedly involve elements that the person has not thought about. In short, it creates a life-threatening problem that the armed citizen has to solve and solve quickly. Our society does not allow the honest citizen to initiate the action. If we are to survive, we have to respond to the threat and overcome it. It’s like running a foot race with a guy who has been given a 10-yard lead. On one particular narcotic raid, the shooting started outside, in the dark. A particular officer rushed outside, assessed the situation and aimed his handgun at the suspect. Then he swung his gun out towards the street, swung back, and made the shot. When asked about it later, the officer stated that, when he aimed at the suspect, he couldn’t see his sights, so he swung over towards a streetlight, lined up his sights and swung back to make the shot. That is a great example of encountering the unexpected and quickly solving the problem. Armed citizens really have two major challenges. 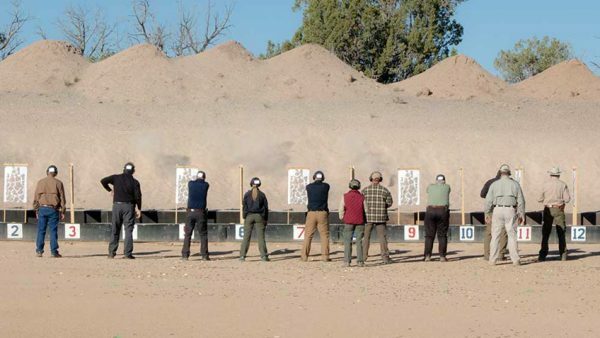 First, they must learn their defensive firearm so well that they can hit a target quickly and efficiently. Second, they also must learn as much as they can about the dynamics of a criminal attack so that they begin to develop an idea of what can happen and what to do about it. Being a good shot is only part of the solution. The rest is learning how to survive a violent criminal attack that has been forced upon you. One way to improve our fighting skills is to take training classes from people who have had to use a firearm to defend themselves. If students will listen, they can get a better understanding of what actually happens in a gunfight. Instructors can’t tell you exactly what your encounter will be like, but they can tell you how similar problems have been solved. In addition to training from those who have actually experienced attacks, one can make use of the internet. There are numerous news stories and even videos of actual gunfights. For armed citizens, these can be great learning tools. Studying these, defensive shooters can begin to see what an individuals did right and what they did wrong. We don’t watch these to be critical; we watch these to learn. An even better idea is to form a discussion group. At a particular get-together, your group goes over a shooting event and then shares ideas about what went right and what went wrong. Were individuals as alert to an attack as they should have been (usually not)? Did they make use of available cover? Did it appear that they were actually aiming for hits or just spraying the real estate? How could it have been handled better? What should they have avoided? So you’ve got the latest and greatest, cool gun and state-of-the-art ammunition. You’ve even learned how to hit a target–most of the time. Now the greater task is before you: Learning how to fight with your gear. That’s how you solve the problem. Should You Carry a Backup Gun? This entry was posted in Concealed Carry, Personal Defense, Philosophy, Training and tagged combat mindset, defensive firearm, gunsite. Bookmark the permalink.